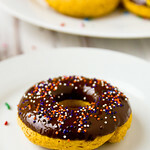 I took the basic cake donut recipe that came with the pan and adapted it for a pumpkin donut. It’s moist. It’s pumpkiny. It has great fall flavors from the pumpkin pie-like spices. And topped with a chocolate glaze and sprinkles, it’s borderline dessert. If you have ground pumpkin pie spice, you can use 3/4 teaspoon in place of the 4 ground spices below – the ratio of spices in the recipe below is how I make homemade pumpkin pie spice. Baked donuts flavored with pumpkin, your favorite fall spices, and topped with a chocolate glaze. Spray a donut pan with baking spray (or use your favorite non-stick method). In the bowl of a mixer, add the flour, sugar, and butter on low and mix until the butter is incorporated. Add baking powder, spices, and salt, mixing until combined. Add Pumpkin, egg, and vanilla. Transfer batter (it will be a little thicker than your standard cake batter) to a ziptop bag. Snip off the corner of the bag (make the opening ~ 3/4 inch) and pipe the batter into the donut wells until 1/2 - 3/4 cup full (you'll get exactly 6 donuts; the batter is thick and holds it's shape, it won't really settle or bake smoothly if you spoon it into the pan). Bake 8-12 minutes, until the top of the donut springs back when lightly tapped. Let cool in pan 3 minutes and then transfer to a wire rack to cool. To make the glaze, melt chopped chocolate in the microwave with oil/shortening. Stir until smooth. Dip the donuts into the chocolate and add sprinkles while the chocolate is still soft. It's easier to store unglazed donuts in a ziptop bag so I only glazed the ones we were eating right then and stored the leftover chocolate in the fridge to glaze the others later. They'll keep fresh for 3 days. Making donuts is SO FUN! I haven’t used my pan in quite a while. This looks like the perfect fall pastry for it! I love pumpkin donuts and this sounds like a great recipe. I tried to get my pumpkin yesterday at the store and they were completely sold out – so sad:-(. 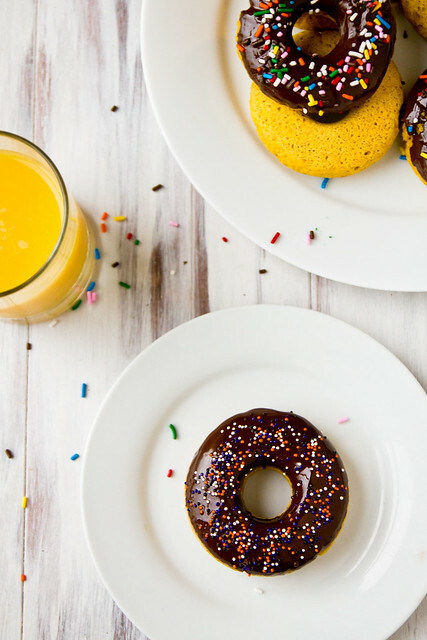 I really need to get a donut pan like yours – my girls would love a treat like this! Hmm…we’ve been seriously debating a donut pan for a while now. Now that we’ve seen these pumpkin numbers, we NEED one! I love making pumpkin doughnuts, too bad I cannot find any more pumpkin in stores and I have used the last of my freezer supply. Was the doughnut pan worth a woken up L? Last week, absolutely not. The UPS guy took 3 years off my life, I’m sure of it! Although I recently caved and bought pumpkin pie spice, I used to mix it up myself too. Guess I got lazy and never managed to make a stock of it from scratch. But I too have a doughnut pan, and although I’ve (somehow) only used it once it really is fun! It is like dessert but since it is in ring-form we can claim it for breakfast! Love these too! You said pumpkin and donut in the same title. HOLY SMOKES. That’s a whole plate of yumminess! I’m such a pumpkin-whore for everything pumpkin, I’ll be making these on those gimme-gimme-pumpkin days once it cools down here in SoCal. Sooo gorgeous! They also don’t sell baked donuts here. And let’s be honest…why should I waste the calories when I cake make these myself and eat five of them with no guilt? I’ve been wanting to make pumpkin donuts and now you’ve given me a recipe, thank you!!! I don’t have the pan, so I better get that next! 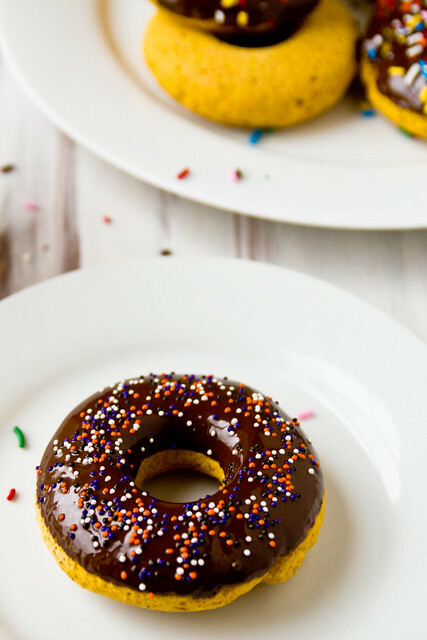 I’m so, so glad I have a doughnut pan at this very second- can’t wait to make these! Perfect example of why I need a doughnut pan! Looks amazing! Ah this is genius! I need one stat!! I need a donut pan!! These look soo good. I’ve developed a new found obsession with any and everything pumpkin, so I have to try these. Thanks so much for sharing! Is it like a cake donut? I mean as opposed to a muffin or cookie – does it get that same texture? Yep, it’s a cake donut, but a little softer than the fried cake donuts you get at a bakery. If I didn’t know how badly I need a donut pan… I do now! I just made these donuts and they are delicious! I did notice that you did not state in the recipe where to add the pumpkin or what temperature the butter should be at. I added the pumpkin with the egg and melted my butter and they turned out fine. wow, that was some omission! thanks for the heads-up.